After three years of holding its annual convention in partnership with Cherokee Media Group’s National Remarketing Conference during Used Car Week, the National Auto Auction Association will return to having its own standalone event this fall. NAAA is hosting its event Sept. 30 to Oct. 3 at the JW Marriott in Indianapolis. Used Car Week is scheduled for Nov. 11-15 at the Red Rock Casino, Resort & Spa in Las Vegas. Bill Zadeits, who is president of Cherokee Media Group, said: “We will continue to strongly support the NAAA and its meetings to accomplish the important work of the industry and for the good of the entire auto remarketing community. Ron Smith decided to roll the dice in 2001. It wasn’t long after 9/11, and the aftermath of the attacks was having a big impact on the business travel industry. Hotels were facing cancellations, and many companies were averse to business travel at that point, Smith said. So, Smith, the founder of Auto Remarketing and its parent company, S&A Cherokee, talked it over with his lieutenant, Bill Zadeits. They decided to take a chance and bring the company’s then upstart event, now known as the National Remarketing Conference, to the Bellagio in Las Vegas later that upcoming winter. Smith and Zadeits booked a keynote speaker, Jeff Heichel, who led used-car activities at General Motors, and began planning for a conference in February 2002, which was just six months away. Having personally guaranteed the finances, it was a gamble, for sure, but one that ultimately paid off, Smith said. The event is now celebrating its 20th anniversary with the 2019 installment of the conference, which is part of Used Car Week, being held Nov. 11-15 at Red Rock Casino, Resort & Spa in Las Vegas. Smith, who is retired but remains part of the company’s management team, has passed the NRC reigns to Zadeits, president of Cherokee Media Group (CMG) and group publisher of Auto Remarketing, and Marilu McQuilkin, CMG’s senior director of events and marketing. Zadeits was at the first installment of what is now NRC, which took place in 1999 at a resort on Camelback Mountain in Scottsdale, Ariz. At that time, the term “certification” was a major theme and new buzzword in the used-car industry. Of course, many knew the term from the retail standpoint, referring to the certified pre-owned car programs that had emerged and gained steam in the 1990s. There were roughly 100 people at the inaugural event, Zadeits estimates. To put it in football parlance often used by Zadeits, it was a team scoring a touchdown on an opening drive. Of a four-quarter game. In a season that keeps going and going. And if Zadeits is the coach of that team, then McQuilkin is the tenured quarterback, having led event-planning at the company a dozen years. Both she and Zadeits have seen the wholesale used-car industry go increasingly digital in recent years, and that impacts the topics that are discussed at NRC. McQuilkin recalls a recent interview on the Golic & Wingo radio show with the founder of the Alliance of American Football, which just began play, that touched on how the new league and the NFL can complement each other, rather than competing. “And to me, throughout that interview I heard a lot of similarities and a lot of parallels to the digital and physical auction (markets) and that transformation that they’re experiencing right now,” she said. The radio interview looked at how the two leagues can utilize resources, “so that the two can work off of each other as opposed to compete with each other,” McQuilkin said. “And that’s the nice thing, I think, about the live events is that at an event like the NRC, we have all of that content in one place, from both sides. So that those two different groups, those two different families, can meet; they can interact with each other; they can sit and talk about ways that they can work through the evolution, revolution ... of this digital transformation,” she said. That overall digital transformation in auto, be it finance, retail or wholesale, is coming fast, Zadeits said. And that has impacted the NRC, too. Speaking of transformations, the NRC has certainly had its own over the past 20 years. The linking with CMG’s auto retail and finance events to form Used Car Week earlier this decade. The combined event with the National Auto Association’s annual convention from 2016 through 2018. And an early one: moving the conference to the fall instead of the spring, where many other auto industry events take place. Moving NRC to November several years ago, “gave us a window to say, ‘Let’s look ahead into this next year,’” Zadeits said. Over the years, another change has been that content and that conversation at NRC. Pierre Pons, chief executive officer ServNet Auctions and president of TPC Management Company, is a longtime NRC attendee and has been a panelist at the event, as well. Asked how the conference has changed over the years, Pons said via email: “It’s really gone from concentration on a single platform/channel for wholesale remarketing — and by that, I mean brick-and-mortar traditional auto auctions — to multiple platforms/channels. Added Peter Kelly, who is president of KAR Auction Services: “It’s been interesting to see how the conversation has evolved over the past 20 years, but one thing has remained a constant: the impact of technology on our industry and its ability to improve outcomes for our customers. More than 20 years ago, I attended NRC as the founder of OPENLANE, an early digital disruptor. It was events like NRC that helped us to learn and grow as a company. McQuilkin, Smith and Zadeits aren’t the only familiar faces walking the conference halls. Another is Steve Kapusta, who heads up Ally’s SmartAuction, NRC’s longtime lead sponsor. The CMG team and NRC, he said, has taken an “open perspective” to conversations about the remarketing industry, something that aligns with the values of his company. “When I take a look at that and I take a look at the cultures of both of our teams, we’re there to create, and add and deliver value,” Kapusta said. It’s about looking at “what’s the issue at hand in the industry?” he said. “How do we help people in this industry succeed and open up the door to potential relationships, opportunities and (other) things that will help each other succeed? “That just aligns extremely well with us,” Kapusta said. He said he enjoys the fact that NRC is not about any one particular approach to wholesale or any one particular product or viewpoint. It’s an open dialogue about industry trends. Kapusta also pointed out the value of relationship-building that has come out of attending NRC. Another familiar face around the conference is Nick Peluso of Cox Automotive, who has attended since the early days of NRC. Peluso, who is the president of Manheim Digital Marketplace and RMS Automotive at Cox, said one thing that he, his team and peers have found valuable about NRC is that served as a chance, given the timing, to develop plans for the year and talk strategy. Beyond the presentations and sessions, the conference has included “networking knowledge collisions,” Peluso said. That networking, which Peluso described as planned yet not forced — organic, if you will — is something that has stood out to Smith, the event’s founder. He recalls a conversation with former Manheim leader Dean Eisner at the event years ago. Eisner had approached him, saying how much he had enjoyed the conference. But Smith replied had not seen him in any of the sessions. This story, plus a full photo spread of NRC through the years, can be found in the March 15 Auto Remarketing. The events keep rolling along for Cherokee Media Group. 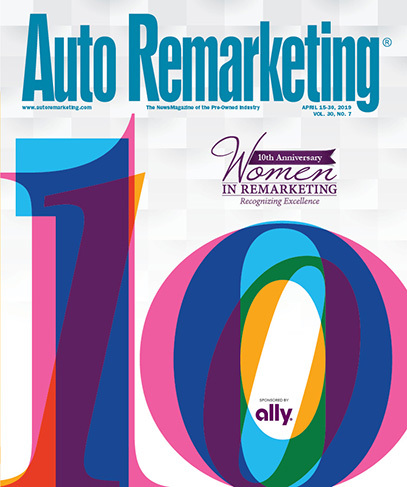 The annual Auto Remarketing Canada Conference runs Tuesday and Wednesday at the Westin Harbour Castle in Toronto. That is followed up on Thursday with the Women & Automotive Canadian Leadership Forum, also at the Westin Harbour Castle. As Auto Remarketing continues to report on the wholesale remarketing strategy of commercial consignors, the story would be incomplete without the inclusion of credit unions. CU Direct said member auto-loan originations by the 1,100 credit unions using the CUDL auto lending platform, as an aggregate, have led the auto lending industry. (Author Disclaimer: I provide media consulting services to CU Direct; they did not participate in this story other than providing the above data, and a data point below). The wholesale credit union market is driven by repossessions. The leading consignor for the nation’s credit unions is Element Fleet Management. It also remarkets vehicles under its fleet contracts, including RVs and other vehicles. Paul Seger, executive vice president, asset remarketing said Element consigns 70,000 vehicles a year, of which 90 percent originate as vehicles repossessed by credit unions. This figure is somewhat remarkable, given the average credit union auto loan customer presents with a 700 or higher credit score, according to CU Direct and AutoCount. In other words, credit union-member car buyers typically don’t fall into the subprime category; one would assume these consumers would have a lower default rate than the average for the auto finance industry. Some news outlets, reporting recently on the Federal Reserve Bank of New York’s consumer delinquency trends, were anything but encouraging: “More Americans than ever are struggling to pay their car loans as overall debt rises in the U.S.,” noted USA Today in its headline. Yet as reported by a Cherokee Media Group publication afterwards, this news, seen in the right perspective isn’t grim. “At first blush, it might look inflammatory that the New York Fed data fueled by Equifax showed that more than 7 million people had an auto finance contract at least 90 days delinquent by the time 2018 finished,” reported Auto Remarketing’s sister publication SubPrime Auto Finance News. “However, the data set also pointed out that more than 89 million people have some form of auto financing — a lease or retail installment contract. That’s the highest figure ever recorded, according to the Fed data from Equifax that goes back to 1999. “All told, auto financing surged by $53 billion year-over-year to close 2018 at $1.27 trillion; again, the highest figure ever recorded.” The report went on to mention that auto financing is just part of what’s pushing overall debt to new highs. Element relies on a multi-channel remarketing strategy. However, its primary channel is its Element Mega Sales live event it conducts routinely in 45 to 50 markets nationwide and runs these through the mainline auction houses. “We make a decision based on the market strength of that particular facility,” Seger said. “We have seen over the last two years a huge movement toward the online course, so I anticipate this channel is going to evolve to bring efficiencies to the overall remarketing process,” Seger said. Helping to build the Cox Automotive portfolio by nurturing organic growth at Autotrader and Manheim is just one of Cox Automotive president Sandy Schwartz’s accomplishments over his three-decade career with the company. Schwartz has been a key member of the leadership team at Cox Media Group and Cox Automotive, helping to grow the company to $20 billion revenue and 60,000 employees. Recognizing that and other achievements, the Northwood University board of trustees has named Schwartz a 2019 Outstanding Business Leader honoree. Northwood University said in a news release that it selects honorees based on personal achievement and that each winner personifies the philosophy of Northwood University. “Since first vested in 1981, the (Outstanding Business Leader) Award has gone to some of the most extraordinary leaders in enterprise in whose company and association we believe you belong,” Northwood University president and chief executive officer Keith Pretty wrote in a statement congratulating Schwartz on the honor. In selecting the honorees, Northwood University uses criteria such as contribution to the philosophy of private enterprise, support of the integration of business and the arts, contribution to education, economic innovation, creative marketing ideas, community involvement, religious leadership, philanthropic contributions and business success. In helping build the Cox Automotive portfolio Schwartz integrated software start-ups such as vAuto and Xtime and helped lead the $4 billion acquisition of Dealertrack and Dealer.com. Cox Automotive added in a news release that Schwartz has also fostered a family-first ethic and an “open, honest and direct culture” at the company. Northwood will honor Schwartz and six other leaders at its Outstanding Business Leader awards event on Saturday. More than 200 people, including past honorees, board members, Northwood students and family members and friends of Northwood are expected to attend. Arthur E. Turner, co-founder of Northwood University conceived the award program, which recognizes leaders in the American free-enterprise system.